The places I visited yesterday were beautiful but I still felt that I had only scratched the surface of Cotswolds beauty. 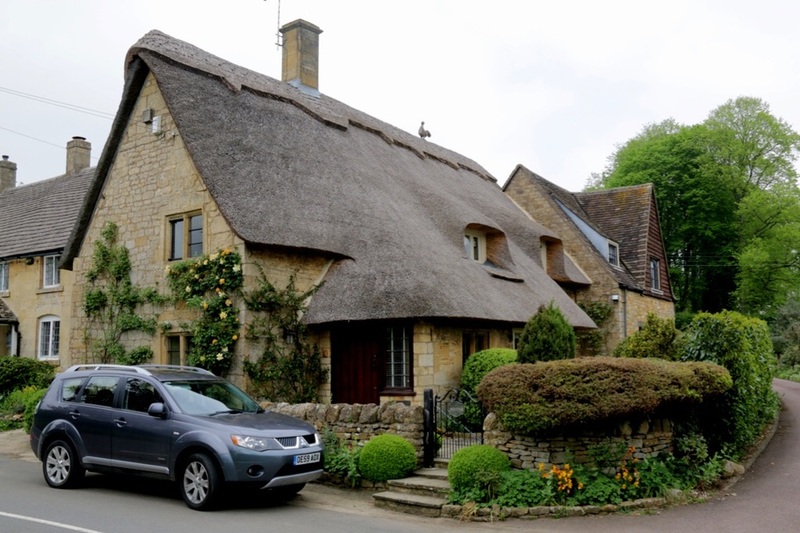 After all, I hadn't seen a proper thatched roof cottage yet! So today I decided to go even more off the beaten track. I picked up some good walking maps from Bourton-on-the-Water yesterday and planned a trip around a place called Chipping Campden. First up I needed to catch the 801 bus again but this time all the way to Moreton-in-Marsh. I had to change buses at the train station. The signal box at the station was very cute. Next I caught the 22 bus to Chipping Campden. The bus wound through Bourton-on-the-Hill, Blockley and Broad Campden. All of them looked gorgeous but only Broad Campden was going to be easy enough for me to get to. By the way, I think the names of these places are just as beautiful as the places themselves. Chipping Campden was another large town, but with lots of very historic buildings in the honey coloured stone of the Cotswolds. I wandered around a bit, but it was very much a sense of more of the same as yesterday. And it was already busy with tourists. I was keen to get back to Broad Campden so I headed off down one of the walking paths. Broad Campden was exactly what I felt I had missed so far. Small, charming, no tourists ... and a good smattering of thatched cottages. I noticed this on the top of one of the thatches. All of the walking paths around the village led to beautiful views. On one edge of the village was a field with sheep grazing. It was great to be able to get up close. My original plan had me walking on to 2-3 other villages. But with this village I really felt that I'd seen what I'd been looking for, plus it was lunch time, plus I was getting a bit tired of walking. So I popped into the Bakers Arms for lunch. I had a delicious spiced parsnip soup with crusty roll. Coincidentally, the Bakers Arms was the local bus stop so I decided to stay there to wait for the bus to start the journey back. As with yesterday, connection times for the return trip weren't so good so it took a long time to get back to Cheltenham. This time I was able to take part of the trip by train (via Worcester) which gave me some time to research options for tomorrow's adventure. I must admit, there were times today when I turned a corner and lost my breath at the beauty and surprise of the scene that appeared before me. Truly stunning.